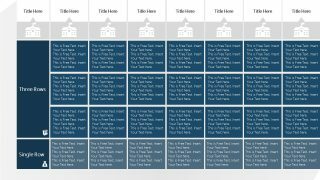 The Flat Tabular Matrix PowerPoint Template is a simple layout for presentation of various data types. 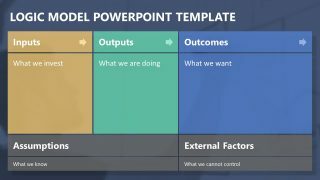 The text and tables PowerPoint slides are widely used in several business and technical presentations. For example, displaying comparisons and complex relationships. The tabular matrix template shows three different design arrangement of rows and columns. 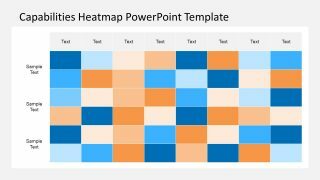 Further, table PowerPoint is a grid of cells where users can insert numerical values, text, icons or symbols. Just like the first two slides with city embassy icons to represent columns. These two slides also provide several row formats i.e. single, thin, and group of two and three rows. 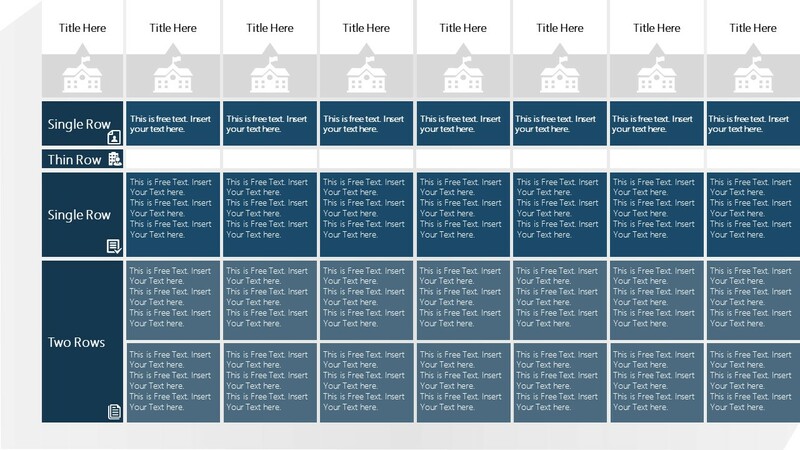 Furthermore, the last template shows a simple table template with option to add bullet list point in each cell. And, infographic icons on corner as a graphical representation of every cell. 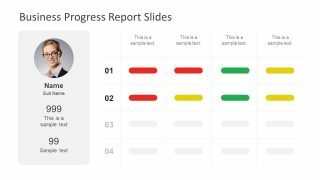 The Flat Tabular Matrix PowerPoint Template is easily customizable to fit any presentation needs. It ensures an organized and professional display of information for a large audience. The users can easily replace text and change the colors of cells for visibility. They can also add shades, glow, and gradient effects to make this flat tabular matrix engaging for viewers. These slides, as a part of company portfolio, can demonstrate comparison of business solutions and their price packages. But these are also useful for qualitative analysis like Harvey balls or capability matrix etc. 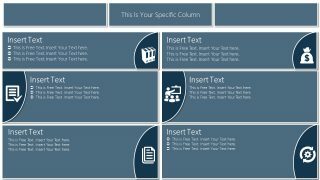 Overall, the flat tabular matrix PowerPoint is a multi-purpose data presentation grid with fully customizable elements. The basic purpose of tabular presentation of data is to quickly understand relationship of rows and columns in matric. Such as comparison table for company products which explains available features. Similarly, a checklist for processes in project development phase or roles and responsibility matrix for employees. 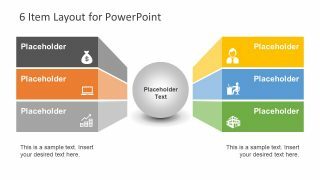 Find more variety of designs for PowerPoint Text and Table Templates in SlideModel gallery.